Ah, but trouble’s brewing in Sweden. A group of international scientists are trying to create anti-matter, and do, and in the excitement afterwards the lead scientist, looking grim, and aping Robert Oppenheimer, says, “We’re in God’s hands now.” His assistant, Vittoria Vetra (Ayelet Zurer, last seen by me in “Munich,” and missed all the while), rushes to his lab to celebrate, and, as we watch her pass through this and that hallway, one thought occurs: “Well, I guess he’s dead.” Otherwise why take the time to show her in this and that hallway? And he is dead. She enters his locked lab by having her eyes scanned but comes away with blood on her chin. It gets creepier. Inside she finds an eyeball on the floor, and, further in, she finds the eyeless scientist dead on the floor. Which raises the question: Why did the killer need the eyeball? If the scientist was already in the room then the killer must’ve already been in the room, too. And if the scientist had been outside the room, why cut out the eyeball in the first place? Couldn’t the killer have just held the scientist up to the scanner? Here’s the worst part: After all this, Howard’s camera drifts and then holds on the spot where the anti-matter had been. To show us that it’s empty. To nudge us. Oh, riiiiight. The anti-matter! I thought they killed him just cuz. 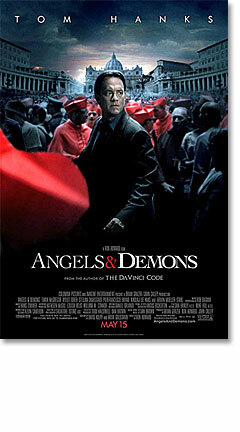 Later Prof. Robert Langdon (Hanks) is corralled from Harvard and brought to the Vatican because trouble’s brewing there. Four cardinals, all preferati (i.e., possible popes), have been kidnapped by a group claiming to be Illuminati, or enlightened ones, the progressive, scientific Catholics of the 18th century who were supposedly brutally suppressed by the Church. Now they’re back for vengies. Plus they have the anti-matter, which, as Vittoria Vetra (also at the Vatican) explains, is known as The God Particle. “It’s what gives all matter mass,” she says. But if it’s allowed to... defrost?...it’ll trigger a reaction that will destroy the Vatican. At exactly midnight. Which is like six hours away. Langdon listens to the tape the Illuminati sent and discerns, from an off-hand reference, that they’re alluding to a path the Illuminati created in Rome way back when, and more clues are searched for and found. It’s a treasure hunt! It’s basically “International Treasure.” A “503,” for example, doesn’t mean 503. Think of it roman-numerically: DIII, or D3, or Book D, volume III of such-and-such a book. And off we go! See the way that Bernini statue is pointing? That’s the direction. Earth, Air, Fire, Water: It all makes sense now! Life is a puzzle; you just need to find the pieces. At least we get to see Rome. Here’s the Pantheon (my favorite), here’s St. Peter’s Square, here’s the Piazza Navona. The four cardinals, representing the four elements, are to be killed on the hour every hour at one of these tourist sites, until, at midnight, we get the big bang. Or re-bang. We see the killer at work and he seems a professional, which he is. There’s talk that the Illuminati have infiltrated the Vatican and we have, basically, three suspects: the young, progressive, good-looking Irish priest who’s friendly with the protagonist; and two grumpy, old, and old-European dudes who do everything they can to impede the progress of the investigation. One thought occurs: “Well, it would be nice if it was one of the obvious guys for a change.” Two hours into the movie...it is! Well, that’s refreshing. Until Vetra begins poking around the desk of the now-dead head of the Swiss Guard. No, don’t do that. A computer pops up and Langdon has a key. No, don’t do that. And in a flash—and a flashback—everything unravels, and it turns out the culprit was the nice, unobvious one after all. Which, these days, means the obvious one. I didn’t say making movies wasn’t hard. Alright, I’ll say it. I am so tired of these last-minute reversals. Appearances can be misleading, yes, but usually they’re not. Put it this way: If the Bush administration were a movie, and with the camera continually panning between Bush, Cheney, Rumsfeld and Wolfowitz, we would discover that the true culprit of the Iraq War was... Colin Powell! But of course! The one man it couldn’t have been!